To overcome these setbacks, it's important to consider the underlying biology of the mammary gland. Ultimately, milk production is a function of mammary epithelial cell number and activity. In other words, to produce large quantities of milk requires a large amount of mammary epithelial cells and these cells need to be actively secreting milk. Applying this to the lactation curve, during early lactation mammary epithelial cell number is greatest. As milk production ramps up this large pool of cells become increasingly active leading up to peak milk production. Following peak milk yield, the mammary gland enters the declining phase of lactation where mammary epithelial cells slowly become quiescent (stop actively producing milk) and undergo apoptosis (programmed cell death), resulting in a gradual decrease in milk production. So why is this important? Anecdotally, I've heard many producers reference "For each pound more milk achieved in peak milk, total lactation yield increases 200 lbs," or a higher peak milk yield results in greater lactation persistency. Consider this: during milk letdown hormones such as oxytocin, prolactin, and IGF-1 are released into the blood stream. As we learn more about lactation physiology it is likely that these hormones target mammary epithelial cells and are important in signaling milk demands of the offspring. 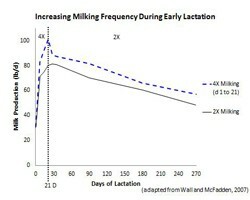 Therefore, increasing milking frequency during early lactation increases the frequency by which these hormones are released, signaling a higher demand for milk. Moreover, some authors have hypothesized that these hormones actually stimulate mammary epithelial cell activity preventing these cells from becoming quiescent and undergoing apoptosis, resulting in greater lactation persistency. Taking this a step further, because mammary epithelial cell number is greatest during early lactation, frequent milking during the first three weeks of lactation influences a greater number of target cells. Essentially, telling the dam there is high demand for milk and it is important to sustain this large pool of actively secreting mammary epithelial cells to meet future demand. As a result, increasing milking frequency through only day 21 of lactation can permanently increase the milk production capacity of the gland even after cows are returned to 2X milking (See Graph). Maybe more importantly, increasing milking frequency during early lactation is simple to put into practice. Milking intervals do not need to be evenly spaced throughout the day; therefore fresh cows can be milked at the beginning and end of each milking (4X). This adds only a modest amount of time to each milking shift and does not require additional wash cycles, improving milk production per cow and parlor efficiency. Despite these exciting opportunities some early adopters of frequent milking during early lactation were discouraged by the results. This is likely because milk production drops as cow's transition from 4X milking to 2X milking. However, it's important to recognize that even though production drops following cessation of 4X milking, increasing milking frequency during early lactation permanently increases the milk production capacity of the udder into late lactation (See Graph). The immediate increase in milk production, minimal labor requirement, and increase in lactation persistency make increasing milking frequency during early lactation a profitable management strategy.